Earlier there were two choices to make a decision between PS4 or Xbox, but either you’d like to admit it or not, there will perpetually be games from the other side of the barrier you wish you could play on your preferred console. The most obvious resolution would be to get both consoles, but that would quickly become a supervision nightmare. Luckily, console modder extraordinaire EdsJunk has come up with a cleaner and smarter solution. Meet the XSTATION, your Xbox One and PS4 in one gateway to gaming paradise. The well-known modst EdsJunk has surprised us with Xstation, his last project and also one of the most interesting that has carried out since it combines a PS4 and an Xbox One in a single casing. This makes the system look like a single console, although inside it is the logic boards and the reading units of each one. 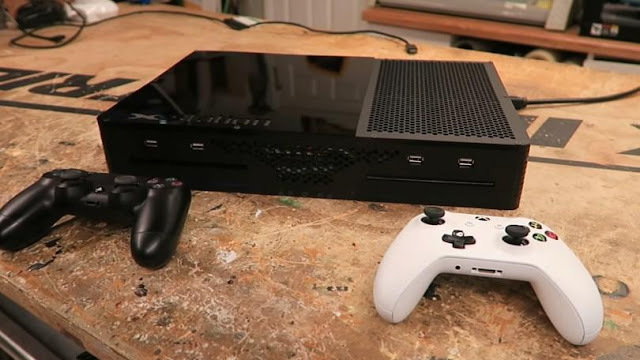 Despite all this said modder has been able to carry out a brilliant integration, which has allowed it to shape a system that is only slightly larger than Xbox One and does not present any temperature problem. Both systems are coordinated through an Arduino microcontroller, which is responsible for alternating the operation of each of them. This is fundamental since the system only has a power supply (internal yes yes), and therefore we can only have active one of the two “faces” of the Xstation. When we connect the Xbox One side the PS4 part goes into sleep mode and vice versa, so the recovery and jump from one to another system is quite fast and very simple as it is done with the push of a button. Obviously, the system is not portable (has a relatively high weight), and we must connect it to an external screen to work, but the charm of the Xstation is the possibility of having two consoles in one. This not only saves space but also allows us to use a single HDMI connector to enjoy Xbox One and PS4. As you can see in the video, we can also use the controls on both consoles without any problem.